Lagos State Governor, Mr. Akinwunmi Ambode on Monday urged residents to cooperate with security agencies in keeping the peace and ensuring safety of lives and property in the build up to the Lagos Access Marathon and the series of political events to herald the forthcoming general elections. Addressing Government House Correspondents shortly after the Security Council meeting held at the Lagos House in Alausa, Ikeja, the Governor said the security agencies have assured that they would leave no stone unturned to ensure that the peace enjoyed in the State would not be compromised. Governor Ambode, who chaired the meeting which had all heads of security agencies in attendance, particularly sought the cooperation of residents for the Lagos Marathon coming up on February 2, urging them to comply with the restriction of vehicular and human movement which would be observed within the routes for the competition. “We have just finished the security council meeting this afternoon and as you are all well aware that the general elections is coming up and in another two weeks we would be having the presidential election and then on March 2 we would have the Gubernatorial election and it’s very clear in our minds also that in this month of February, on the 2nd, we would be having the Lagos Marathon and also some political activities that would be coming up at the weekend and throughout the month of February. “I just want to appeal to Lagosians that just as we have been doing in the past, we have ensured that the Lagos Marathon is very successful and alongside that there would be some kind of vehicular restrictions in some parts of the routes for the marathon. “The security agencies have assured me that we would keep the peace and make sure that there is proper security of lives and property and also ensure that we have a hitch free marathon. I want to assure Lagosians that they should just keep the city safe and also ensure that whatever restriction that we are going to make on that Saturday, they bear with us and also ensure that within the few hours that the marathon would take place they should also keep the peace,” he said. Likewise, the Governor said a lineup of political activities in the build up to the February 16 Presidential and National Assembly elections as well as the March 2 Governorship and State House of Assembly elections which would take place in the State, could require some restriction of movement, just as he appealed to residents for understanding. He also urged residents to report any group or individuals planning to foment trouble in the State to the security agencies, assuring that the peace the State has enjoyed since the commencement of his administration would be sustained. “I want to appeal to all of us to cooperate with the security agencies, all the head of security agencies are alive to their responsibilities and we need the cooperation of Lagosians to make sure that we have a successful season. 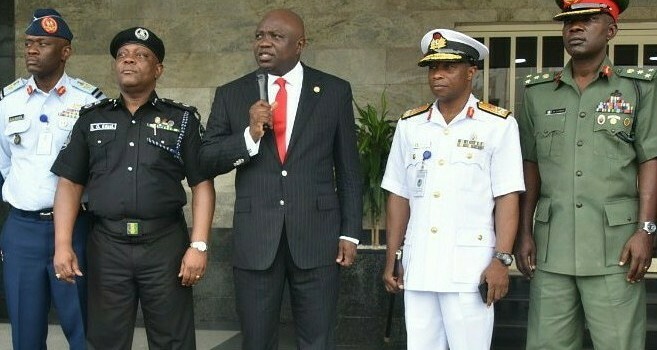 In the last three and half years, you can also notice that security in Lagos has improved tremendously and we intend to keep that for the rest of the year and also ensure that whenever we notice any untoward behaviour or activity from any group please be free to notify any of the heads of security agencies and we would make sure that this city is safe and prosperous,” Governor Ambode said. Also speaking, the Commissioner of Police in the State, CP Imohimi Edgal said the Police have been holding series of stakeholders’ engagement to carry everybody along, assuring that security agencies were prepared to ensure that the inconvenience as a result of the Marathon and other political activities is minimized. The CP also warned persons planning to use the series of upcoming activities to cause chaos in the State to desist from such, warning that security agencies are on red alert to deal decisively with such persons if caught. “Having said that, let me also use this opportunity to inform Lagosians that in the coming days, they would be seeing a lot of police, military and other security agencies operations and activities across the State. Don’t be alarmed, it’s in order to ensure that we have hitch free exercises and anytime you are approached to vacate a location or suspend activities in a location, please cooperate with security agencies,” he said.